On August 21st, 2017, a solar eclipse will be happening throughout the United States, which has created a lot of excitement and questions from our readers and customers. As a result, I wanted to put together a small guide on how to properly and safely photograph this incredibly rare event. Let’s get out and photograph the first full solar eclipse in the United States since 1991! But before you run out and point your expensive DSLR directly at that big ball of fire we orbit, maybe we should talk about safety, what’s happening, and gather some equipment first. Cool? Ok, so what’s happening? On Aug 21st, 2017 the sun will disappear behind the moon totally eclipsing the sun. This will effectively cast some degree of twilight across the United States and especially in the path of totality. The path is about 70 miles wide and extends in a straight line from South Carolina to Oregon. The last time the United States saw a coast to coast total eclipse was in 1918. The eclipse duration is about 2.5 plus hours long with totality lasting up to 2 minutes and 40 seconds in some locations. What’s really exciting about this is you will be able to view the suns corona with the naked eye during totality. This time around the United States is the only country that will be able to view this eclipse in its entirety. The eclipse starts and ends at different times depending on your location. Wanna know more? Space.com has an excellent guide including eclipse start/end location time charts. WARNING: Permanent eye damage will occur if viewing the sun either directly, through binoculars, through a telescope, or through the view finder of your camera. Never view the sun directly without solar viewing glasses. The first and MOST important item in your bag should be eclipse viewing glasses. It’s paramount that you protect your eyes at all times when looking at the sun. They are cheap and you can get a ten pack for about 15 bucks on Amazon. I’ve used these for years and have never had a problem. Finally, don’t forget other items to make your adventure more enjoyable like a small chair, umbrella, sunscreen, water, snacks and a hat. Your success of eclipse will depend on your location within the United States. 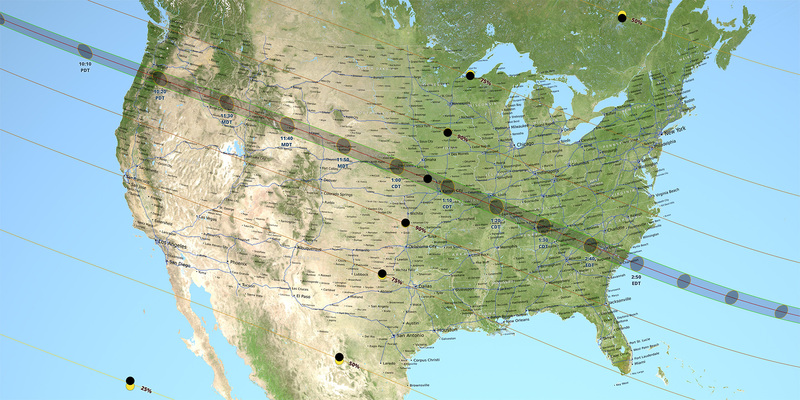 While the eclipse will be seen throughout the entire United States, the best viewing spot of the eclipse occurs through Salem, Oregon down through Charleston, South Carolina. Use the map below as a reference guide, and if you’re able to increase your magnitude, take the extra effort to make it happen. As for your location during the setup process, it’s entirely up to you. 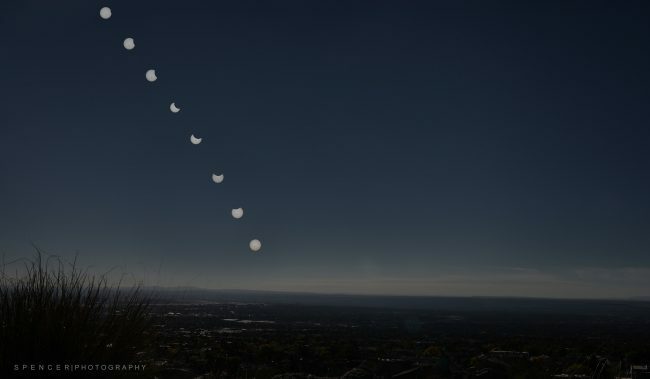 Do you want to grab 10 good shots of the eclipse progression and then stack them on an underexposed base image to give your final image a good composition and perspective? If so, then get out and grab a shot of a pleasant landscape that fits the eclipse location and elevation. If you do want to stack, remember this eclipse is happening mid-day. So stacking the eclipse low on the horizon of a base image won’t make much sense. If not, then just shoot anywhere you can get the full effect of the eclipse and then put together a cool collage of the progression. What Equipment Will I Need for My Camera? WARNING: Do not photograph the sun without a solar filter on your lens. Using a long zoom lens and pointing your camera at the sun for extended periods can overheat the interior. This will result in an expensive repair or unrepairable equipment damage. Solar Filters Solar filters affixed to the end of your lens block 99% of the suns light from entering into your telescope or camera. You cannot take a usable photo without a solar filter. The two most popular type of solar filters are aluminized polyester and black polymer (both plastic). Both are excellent choices for the eclipse photographer on a budget, come in multiple sizes to fit your lens, and are about 20 dollars. 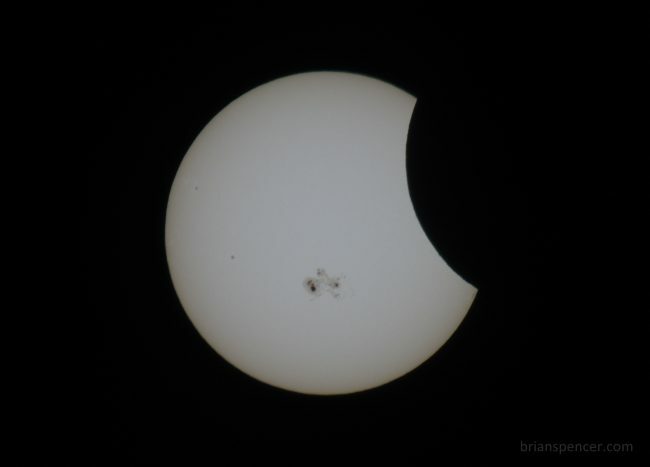 I prefer a telescope glass solar filter for its better optical performance. It’s about three times the cost but worth it, as we all remember what Roger says about putting a cheap filter in front of your expensive glass. Some telescope filters are tricky to fit. I measured the diameter of my lens and then ordered a glass solar telescope filter with a diameter a bit larger to secure in place. So what about neutral density (ND) filters and what’s the difference between those and a solar filter? Depending on what optical density (how dark the filter is) you choose, ND filters only block 10%, 20%, etc of the suns light. That is not nearly enough to protect your camera or capture a usable photo. Sure, you can stack about 5 to 8 ND filters to achieve the 99% block of incoming light, but now you’ve given up most of the optical quality of your lens resulting in blurry and unusable photos. This is where a solar filter comes in. 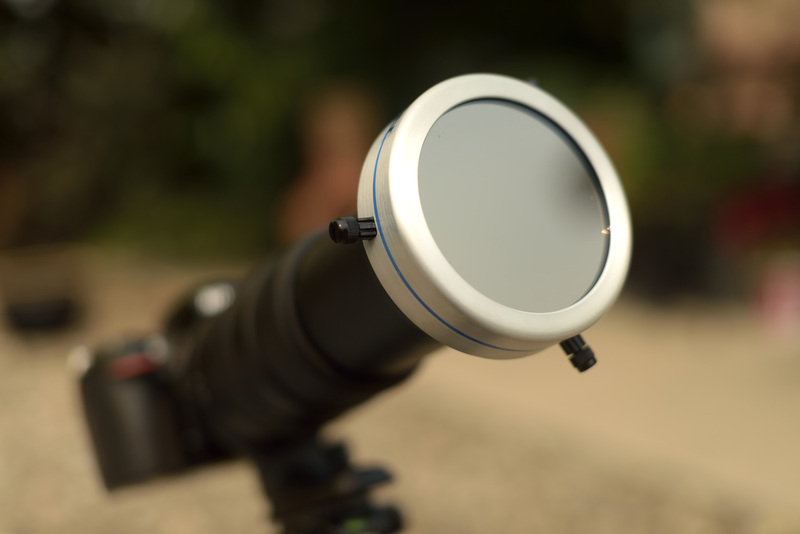 A single solar filter blocks 99% of the suns light while maintaining sharpness and clarity. I’ll be using a Nikon D810 and a Nikon D750. However, a full frame (FF) camera vs a crop sensor doesn’t matter too much. Of course, a full frame sensor is going to generally yield a better image quality, but we will be shooting at long focal lengths, and the added focal distance when using a crop sensor can be advantageous. The added dynamic range of a full frame sensor isn’t entirely important because this is, for the most part, a two color photo. Black background and the color of the sun. Also, ISO performance is not a factor here since all cameras, for the most part, perform really well at ISO 200. Ok, this is the most important part. You need a good long piece of glass to photo the sun – at least 400mm plus. If I had my choice, I’d use a Nikon 800mm f/5.6E FL ED AF-S VR. But I don’t have that and it’s $15,000. So, I’ll be using a Sigma 50-500 f/5.6-f/6.3 and then cropping it a bit. In the past, I’ve used a Nikon 18-200mm with a 2x teleconverter that proved to be pretty good. If you’ve chosen to use a crop sensor, remember to multiply your focal range by your crop (usually 1.6) to get a representation of your true focal range. To wrap up, no matter what camera you are using, find a good long FF 400mm (or longer) lens. When photographing the sun, fast lenses (f/2.8, etc) won’t buy you much except faster shutter speeds. You can photograph this event without a tripod. But I wouldn’t recommend it. Why? You will be shooting at 400mm or more. Even if you have an image stabilized lens there is still a chance for soft focus if you are shooting handheld. Also, during the shoot, the sun and moon will be moving. You will constantly need to adjust your cam to compensate for the movement, so a tripod will come in handy to make minor adjustments. Additionally, your arms and shoulders won’t get tired holding up all that equipment for the duration of the eclipse. Ok, so what settings should you start out with? All cameras will be different and your filter choice will affect this too. However, most will expose nicely at around f/7.1, 1/160th of a second shutter speed, and an ISO of about 100 – or close to that. It’s a good place to start and you can make adjustments from there. If you do need to make any changes, start with your shutter speed and then ISO adjustments. You really should use an aperture of f/6.3, f/7.1 or f/8 because a shallow depth of field is unnecessary here, and lenses generally yield sharper images at these f-stops. And remember you will be making constant changes to your settings as the moon moves in front of the sun. In fact, as the full eclipse happens you may have to lower your shutter speed and raise your ISO to compensate for the lower light coming from the full eclipse – so be ready. For those 2 minutes and 40 seconds, you should be standing in front of your camera and ready to make adjustments to your settings. Ultimately, you should end up with 200 plus photos during that time period. Its digital, take a photo every 2 to 5 seconds and adjust. Remember to turn off Auto ISO and shoot in RAW to take advantage of the shadow and highlight adjustments in your favorite RAW editor. Finally, autofocus once and then turn off the autofocus on your lens. Why? You may miss a shot if your camera can’t AF on the sun during the shoot. Get on site early, focus and then turn off AF. Now we get into the tricky and risky part. Experts at NASA and Space.com say it is safe to view the full totality of the eclipse without solar glasses. Equally, once totality is happening you will have to remove the solar filter and you might have to quickly adjust your camera settings for totality. Just in case, be ready to do this and know exactly how to quickly adjust your ISO and Shutter Speed. However, your camera settings should be about the same. Consider this; A solar filter blocks 99% of the suns light and the moon will be blocking 99 to 100% of the suns light during totality. So, you may even have to lower your shutter speed a bit and raise your ISO a bit during totality. Partial eclipse in Oct of 2014. Settings: 1/125, f/6.3, ISO200 Glass telescope filter. Practice. Practice. Practice. This is important. A few weeks prior, you should get out and practice photographing the sun then go home, edit and if need be, adjust your settings, etc. Experiment a bit and see what might be best for you and your equipment. What’s cool is, you can do this in your backyard every day until you feel confident enough that when Aug 21st arrives you will capture this event like a pro. And most important, take your friends and family and have fun. This entry was posted in General Photography and tagged aug 21st, eclipse, moon, sky, solar, solar eclipse, sun by Spencer Photo. Bookmark the permalink.